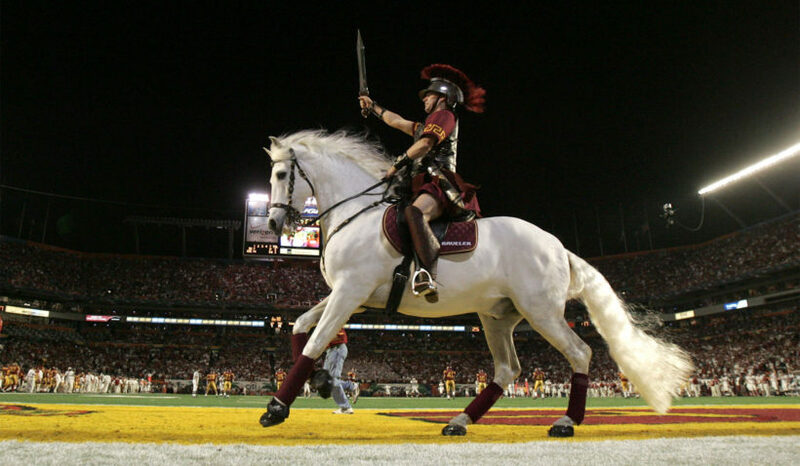 University of Southern California's school mascot, Traveler. (by Victor Davis Hanson, RealClearPolitics) – …William Shakespeare had a healthy distrust of the sort of mob hysteria typified by our current epidemics of statue-busting and name-changing. In Shakespeare’s tragedy “Julius Caesar”…a frenzied Roman mob, in furor over the assassination of Julius Caesar, encounters on the street a poet named Cinna. The innocent poet was not the conspiratorial assassin Cinna, but unfortunately shared a name with the killer. Shakespeare certainly would recognize that, like the playwright’s Roman mob, we have launched a war against words in our frenzy to find targets for our politically correct madness. Recently, there were progressive calls at the University of Southern California to rename the school’s mascot, the white Andalusian horse “Traveler.”* Members of the left thought that the mute animal’s name too closely resembled the name “Traveller,” the favorite horse of Confederate general…Robert E. Lee. Lee the sportscaster, like Cinna the poet, was found guilty on the basis of ignorant association with his name. If the politically correct herd could not get its hands on the long-dead [Confederate General] Robert E. Lee, it would apparently settle for anyone in the present who shared nearly the same name. 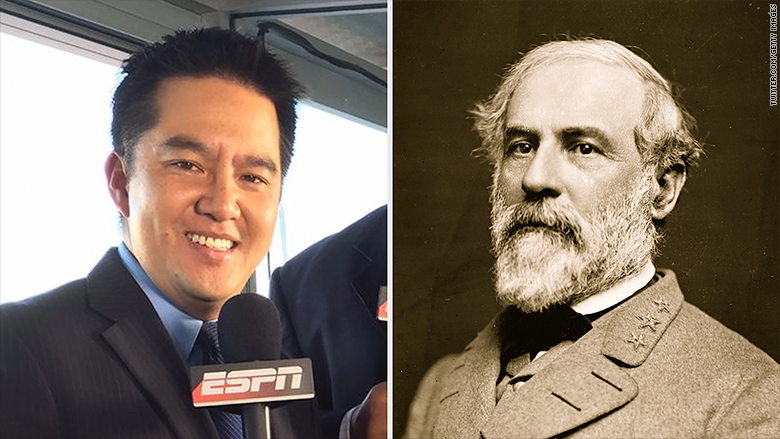 ESPN announcer Robert Lee (left) and Confederate General Robert E. Lee (right). Why would a supposedly civilized country descend into such linguistic fascism? Part of the problem is the presumption by elites that a supposedly illiterate public must be protected from itself. But does anyone really believe that average people will confuse an Asian-American sportscaster who has the common Chinese surname “Lee” and the all-American first name “Robert” with a Confederate general — or that the sportscaster could thus be somehow tangentially connected with the recent violence in Charlottesville? ESPN, however, does not bet on the intelligence of the average American. It prefers to virtue-signal that it is above all suspicion of sympathy for the Confederacy. In its search for cosmic justice, it cares little about the injustice it metes out to real live people. ESPN has long politicized sports and continues to lose viewers over its adolescent political correctness. Not long ago, the network fired tennis commentator Doug Adler. He had characterized the aggressive play of tennis star Venus Williams as employing the “guerrilla effect.” (“And you’ll see Venus move in and put the guerrilla effect on, charging,” Adler had said.) Adler’s reference was drawn from the once-popular term “guerrilla tennis” that denoted a tough, brawling, take-no-prisoners style from the 1990s. The word “guerilla,” remember, is a diminutive of the Spanish word “guerra,” (“war”). In Spanish, “guerrilla” means “little war.” In English, “guerilla” is commonly used to describe a type of unconventional fighting. But Adler forgot that “guerilla” is pronounced the same as its English homophone “gorilla.” Some ESPN viewers did not understand the guerilla reference and charged that Adler was using “gorilla” as a racist smear. Adler tried to explain the reference, but he was fired and his career was ruined, making him a modern-day Cinna the poet, torn apart by the mob. When a cowardly and self-righteous ESPN assumes the worst in people, it hopes to find protection for itself from the thought police. When chronic inner-city problems — epidemic levels of murder, drug use and out-of-wedlock births — cannot be solved, frustrated progressives start looking for extraneous targets to blame. And so attention turns to, for example, an Andalusian horse — as if changing the animal’s name is at least proof that they care. Most revolutions eat their own. Monday’s most fanatical revolutionary becomes a counterrevolutionary sellout by Tuesday. Once left-wing activists forced cities and states to pull down their politically incorrect statues in the dead of night, and once they got off scot-free in defacing and destroying publicly owned monuments, it was an easy step up to the next level: waging war against words themselves. In totalitarian societies, cities change their names regularly. Statues go up and are torn down. Words, as the historian Thucydides warned 2,400 years ago, habitually change their meanings to reflect passing political orthodoxy — and thugs, commissars and brownshirts oversee the charade. For an antidote to these statue-smashers and name-changers, Americans seek just one honest public official who dares to say “no more” — and arrests rather than appeases those who destroy public property, or shames those who ruin people through guilt by association. Victor Davis Hanson is a classicist and historian at the Hoover Institution, Stanford University. His latest book is The Savior Generals. You can reach him by e-mailing author@victorhanson.com. Published Aug 31, 2017 at RealClearPolitics.com. Reprinted here on September 7, 2017, for educational purposes only. May not be reproduced on other websites without permission from RealClearPolitics. 1. The purpose of an editorial/commentary is to explain, persuade, warn, criticize, entertain, praise or answer. What do you think is the purpose of Mr. Hanson’ editorial? Explain your answer.